I shared a blog article from Thom Rainer yesterday on Facebook called “Seven Ways to Hurt Your Pastor”. I shared it, not to make a point nor to direct it at anyone, but simply because I agree with the article. I received quite a bit of feedback from sharing it which prompted me to write this post. I have experienced all of the hurts that Thom Rainer listed as well as some that are not there but I thought it would be good to write a article from the other perspective. 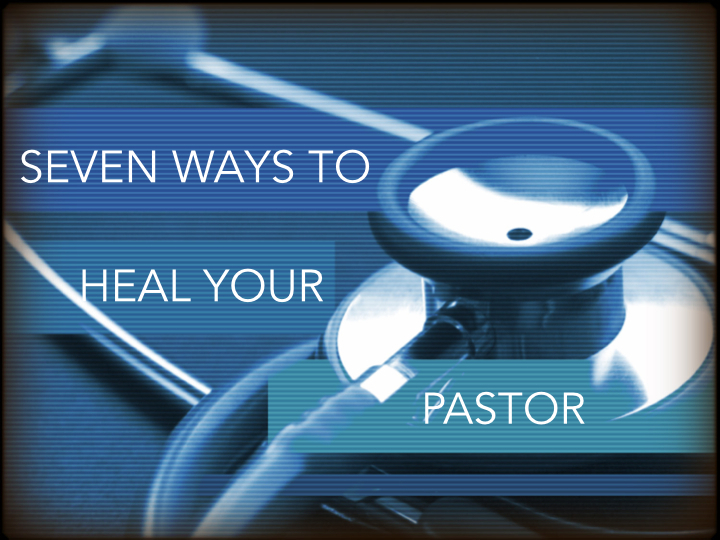 I used the word “heal” in the title because it’s a pseudonym of “hurt” but what I mean is how you encourage your pastor. Having pastored a church for 5 1/2 years now, I’ve not only experienced some hurts but also some encouragement. This list may surprise you because it doesn’t included saying how good you thought the sermon was or how good of a person you think he is. It’s different than that. There is nothing that encourages your pastor more than your faithfulness. It’s true that when you don’t come it can be discouraging but when you’re there, when you’re faithful to worship, it lifts your pastor’s spirit in ways you’ll never know. The pastor spends his entire week getting ready for Sunday. Oh, there’s a lot of things we must do throughout the week with church administration, helping the hurting and making disciples but there’s nothing like Sunday morning worship. We look forward to it all week long! Also, when you’re faithful in your giving. Nothing will put a knot in your pastor’s stomach on Monday morning quicker than a bad offering report from Sunday. But, the opposite is also true. Nothing makes a Monday morning sweeter than when your pastor sees the offering report and you were faithful to give. Now, he can go on through his week without financial worry nagging ruthlessly at his subconscious. Every pastor has stories of watching church people shred each other in disagreement and conflicts. But, when you love each other, I mean really love each other, it is incredibly uplifting to your pastor. Not only when you say “I love you” but more when you treat each other in genuine love in how you act, live and cooperate. To see you do that, makes your pastor feel like you’re loving him. When your pastor sees you pour out your life when it’s not easy, that’s so encouraging. It’s at this moment he remembers that he’s not doing this alone and it’s not all up to him. Sometimes he feels like everyone is expecting him to spend his life (and sometimes his family’s life too) for the Gospel but when you live a sacrificial life it let’s him know you’re willing to spend your life too. I can’t tell you how uplifting it is for your pastor when he gets to serve with you in this kind of way (instead of just serving you). It’s always encouraging when you tell your pastor you’re praying for him but that’s not what I’m talking about. I mean when your pastor sees you come to prayer meetings, praying at the altar, or even better, when he finds out that you took it upon yourselves to have a group prayer time without him planning it or asking you to do it. I can’t put into words what that means to your pastor. Again, he’s reminded that he’s not alone and he’s reminded that people are impacted by Christ and following Him. What I mean by worship is when your pastor can hear your voices filling the worship center, when you raise your hands (those of you who do that sort of thing) and when you’re so focussed on Christ that the tears are running down your face. It is so encouraging when you worship with smiles across your face and joy beaming from your countenance. It so makes a pastor remember why he’s doing what he’s doing and that the Word is bringing return. (Remember, Sunday is the day he’s always working for and toward.) There’s nothing like people worshiping God is Spirit and Truth! Many pastors wives don’t struggle because of people disrespecting or being unkind to them, they struggle because they so often feel left out. As awesome as it is for your pastor to see you interacting with each other, especially outside of church services, it’s incredibly uplifting when you invite and include his wife. Nothing breathes life into your pastor more than when the church is breathing life into his wife. When she has joy in the ministry so does her husband. Do any of these surprise you? Much more than verbal expressions like, “that was a nice sermon” when you’re walking out the door Sunday, the above are ways that you can be a huge encouragement and even bring healing to some of the hurt your pastor has. Try it out, you’ll make a difference. Yes, that’s a good one too. Rockin’ some @daschapparel today. Thanks @coach_teid!